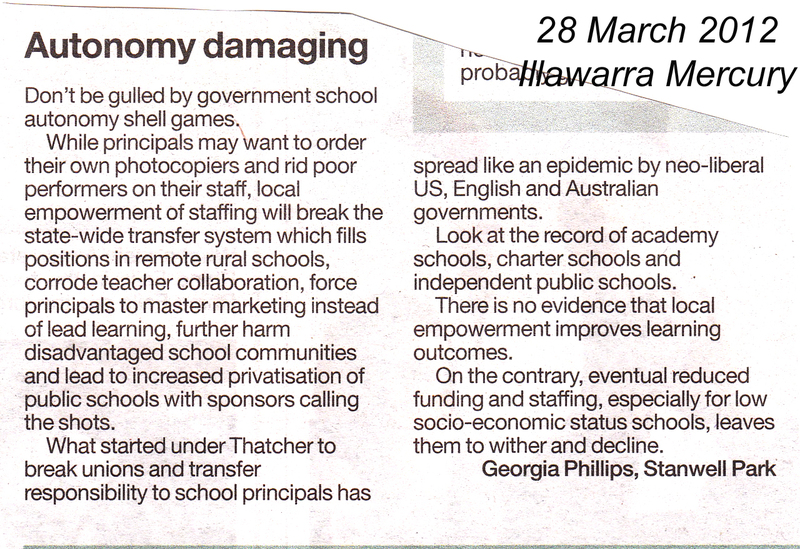 Currently, a campaign is being run by the School Library Association of NSW and the Illawarra School Libraries Association to lobby local members about the deleterious effects of LSLD on teacher librarian staffing. 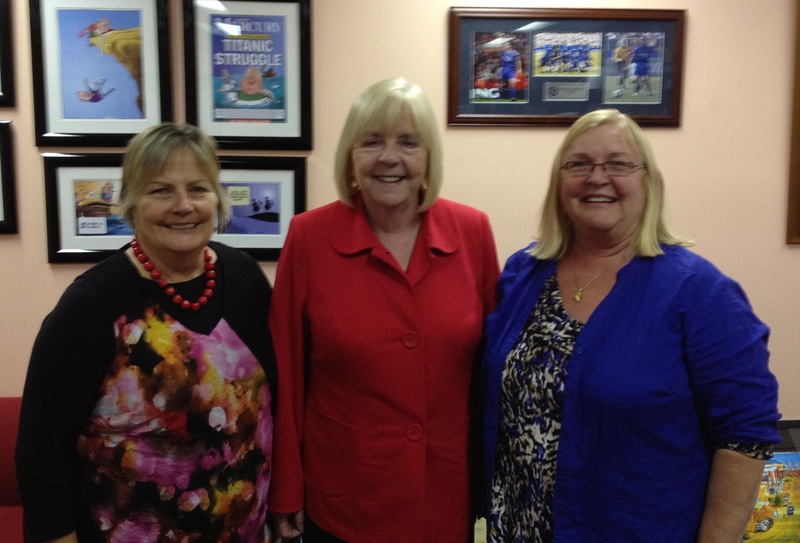 Three politicians have been visited, with Noreen Hay, Wollongong MP, the latest (16 May 2012). While Keira MP, Ryan Park, asked questions on notice on our behalf, and Pru Goward made a submission on our behalf, Noreen Hay, Wollongong MP, will present Notice of Motions to provoke debate in the NSW Parliament on the effect of Local Schools, Local Decisions on public school libraries and teacher librarians. The NSW Liberal government has announced its policy of school autonomy, Local Schools, Local Decisions, with devolution of staffing, budgeting and support services. While BER difficulties showed that schools probably need some leeway in using local contractors and guiding their own building projects, local staffing without protection of specialist positions, decentralization of support services and global budgeting have not been shown to improve student outcomes. The elimination of earmarked state funds for the library has had drastic results. According to the 2008 Australian School Libraries Research Project, almost ten percent of NSW schools had budgets under $1000, with almost half of those under $500. This is for all school sectors, so can only be a guide for government schools. This decline directly relates to literacy NAPLAN results according to surveys conducted by Softlink. As for local control of staffing, we already know what has been the result for other states and territories. 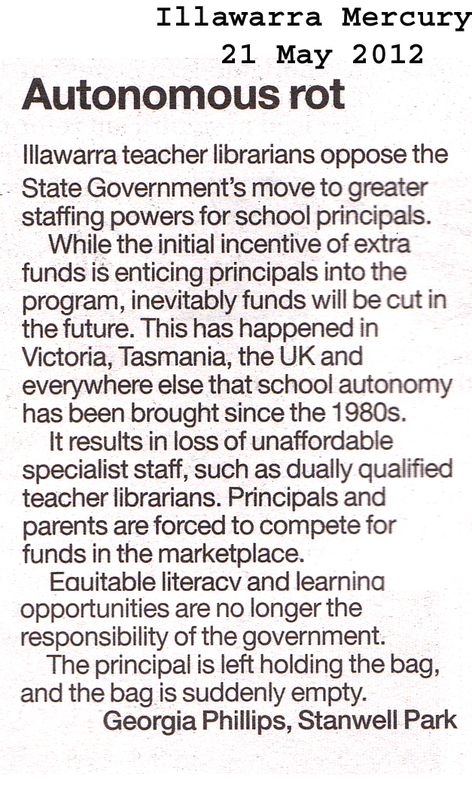 In Tasmania, as a direct result of “self-management” brought in in 1991, secondary school teacher librarians lost their separate staffing entitlement (primary school teachers suffered this fate some years earlier). 67% of schools in Tasmania now do not have qualified teacher librarians. In Queensland, support for school based management (SBM) continues to affect school staffing. 10-15% of Queensland government schools do not have qualified teacher librarians. Now seven state high schools on the Gold Coast have no teacher librarians. In Victoria, Schools of the Future (1993), Kennett’s version of SBM, has seen the loss of at least 35% of qualified teacher librarians, 87% in primary schools. Ever shrinking state budgets have meant that principals have had to cut here, cut there over the years. Gradually, all non-face-to-face teaching positions have disappeared – careers teachers, teacher librarians, student welfare co-ordinators and so on. In the ACT, School Based Management began circa 1997. 50% of government primary schools in the ACT do not have qualified teacher librarians. 90% of WA government primary schools have no teacher librarians. Under the current government’s Independent Government Schools scheme now secondary TLs are being lost. At the Perth Inquiry hearing, WA DET stated that 77 out of some 800 schools have qualified TLs. 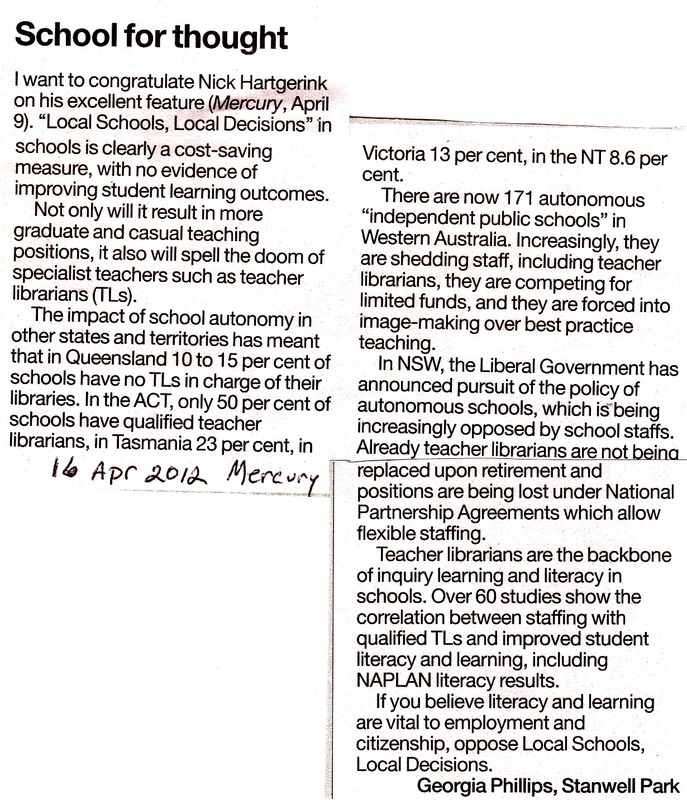 Under their new teaching award which no longer guarantees separate staffing of specialist teachers, South Australia is now losing its qualified teacher librarians, even in high schools. All this with no convincing evidence to justify school based management on the basis of improved educational outcomes (Lindgard, 2002). Indeed, there is plentiful research to show that well-staffed school libraries correlate to improved student literacy and academic achievement. Until devolution, all states and territories had central resource and library support services. Six are gone. WA’s is in decline. Recently, NSW School Library and Information Literacy unit was threatened by restructuring, but, thankfully, still exists. Such services advise on policy, review print and digital learning materials, support professional learning, provide bibliographic, central cataloguing and publication services. In NSW, these include the excellent journal SCAN, the Handbook for School Libraries, OASIS Library support materials, copyright information, and teaching support materials embedding ICT use, IWBs, information literacy, ethical use, cyberbullying, plagiarism and social networking to demonstrate good pedagogy. These are not services which can come from the regional or school level. Global budgeting is sold to the community as a way for principals and schools to determine their own needs. In reality, they have become a means by which governments of all persuasions have been able to continually slash education budgets without having to wear the pain. “The school made that decision” is the constant refrain when a well loved program is axed. Our situation is part of a much larger issue of declining education funding. Over the past 20 years, education funding in Australia has declined, as funding in other OECD countries has increased. We are now among the lowest funding countries in the developed world, 28th after Lithuania and Greece. Local control of local schools is fine for local projects. But without adequate funding and without transparency in decision-making and accountability, it will only send us further down the educational and economic ladder.